Large upscale starter - 2 BR/1BA, patio, dl includes 2 custom windows too. $15,838 Unfurnished. Are your sims ready for spring? Get them The Sims Zone tank/capri outfit. Includes a new capri mesh for a fit, but thinner build model, relaxed fit, low waist capris. Stock options matured? 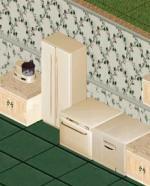 Why not treat your techie sims to a house on the Plateau? Requires Livin' Large and the Black Window and Door Set (also from my section) as well as Andy's Toyota SUV (Hunter Green). Federal style long and short windows plus door in black. A whole pack of guy heads - lol. 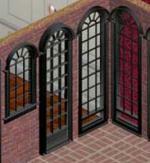 Meshes by Maxis or Fionn of Simfreaks. 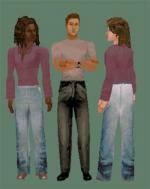 Two outfits for your male sims - one jeans/top "based" on a NYBASED outfit and one pants/T. All skin tones. Mesh for jeans by bRuDe. Dog House, Cat Structure, Pet Post, Counter, Silver Pet Bed, Fluffy Pet Pillow, Litter Box and, of course, Poster of Dogs Playing Poker (backless). Requires Unleashed.